When you bring home a new puppy it is easy to allow yourself to be ruled by this new addition to the family. Mealtimes can become a regular battleground and once you give in to him, it can be a mistake. The one thing to establish is a routine that shows your dog that you will not respond to his whims. However, you will have to ensure that your whole family is using the same routine or your puppy could become unsure of himself, resulting in a few puddles on the kitchen floor. A puppy that is unsure about his mealtimes can become very territorial and possessive over his food bowl. This behaviour can become quite difficult, although with an established routine and a bit of patience he will soon settle again. 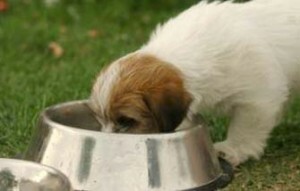 Start a new routine by placing the puppy’s bowl, with a small portion of food, on the floor and move away. When the bowl is empty, return to the bowl and then add a little more food to show him you are going to provide food for him. He will show you he is happy when he wags his tail, but now he needs to get used to the idea that you can approach while he is eating his food. The next meal is the one where you are going to give him his full portion of puppy food at once. Sit near him and add a special treat to his bowl while praising him all the time. This routine should be repeated only by you at his mealtimes until you feel your puppy is at ease. A family member should only be encouraged to take over this routine under your supervision, to avoid any unwanted anxiety returning. A puppy who has become a member of a family with small children can be unpredictable. A puppy needs to know he can trust a child’s behaviour. Do not leave a young child to play or feed a puppy without supervision.